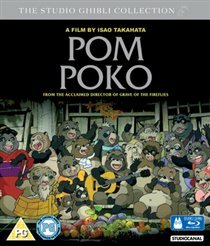 Acclaimed Japanese animated feature from Studio Ghibli. deep in the forest, a group of magical shape-shifting raccoons live happily together. But when human construction workers arrive to build new homes for an expanding Tokyo, the raccoons decide to fight back. Disguising themselves as humans, they sabotage the construction equipment, but when this doesn’t have the desired effect, they decide to use all of their powers in one final display of awesome magic.